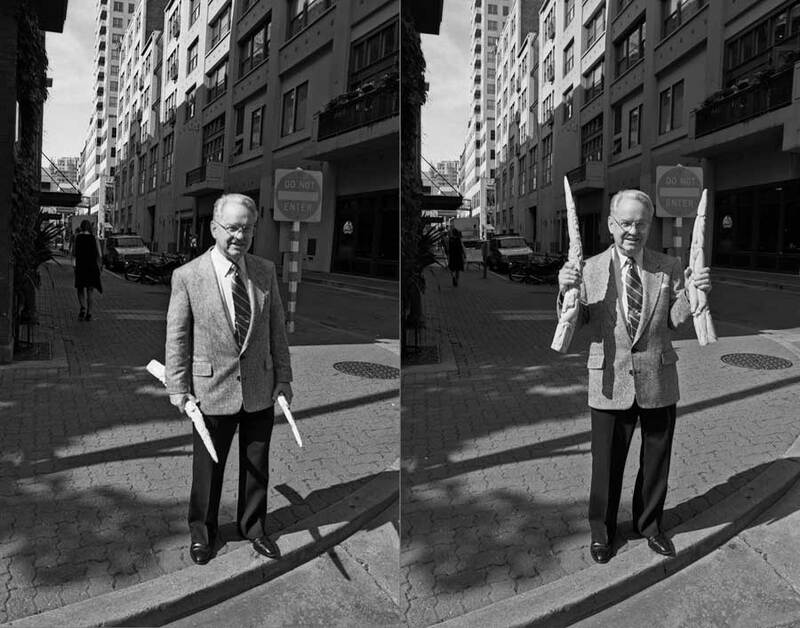 NOW: Jean Sherrard’s wide angle “now” of the Central Business district also includes the Hoge building, this time right-of-center and barely detectable beneath its neighbors. Colman Dock and the “Mosquito Fleet” steamer the H.B. Kennedy were both built in 1908-09: the later in Portland to join the dock after a maiden voyage across the Columbia Bar, up the Washington coast and through the Straits of Juan de Fuca. Here the 179 foot-long and famously fleet Kennedy is – I think – backing away from the 700-foot dock to resume the back-and-forth “Navy Yard Route” service to Bremerton that it kept at for many years. This Colman Dock is not quite the same as the one that the Kennedy first made its home in ‘09. 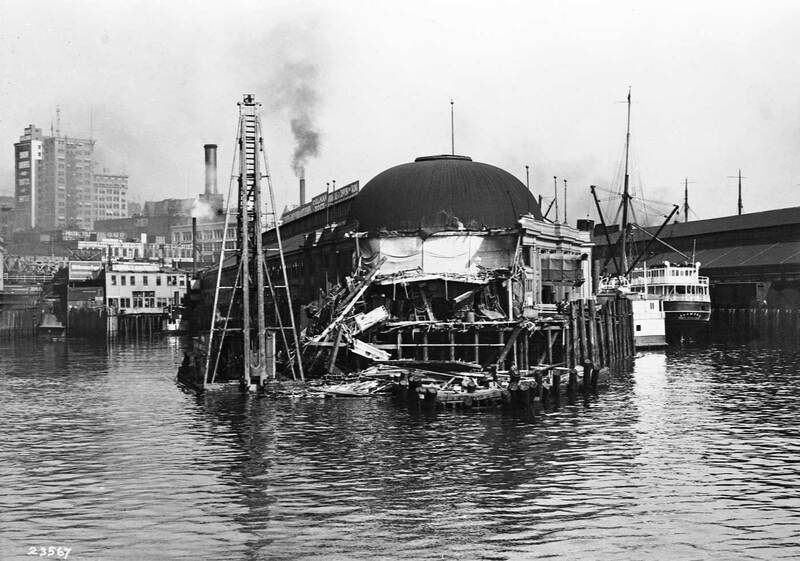 In 1912 the ocean-going steel steamer Alameda crashed into and through the dock’s outer end splashing the first tower and dome-topped waiting room into Elliott Bay. This new tower and welcoming façade were designed by architect Daniel R. Huntington, whose surviving landmark list includes the Lake Union Steam Plant, the D.A.R.’s “Mount Vernon” home on Capitol Hill and the Wallingford Fire Station, now a health clinic. 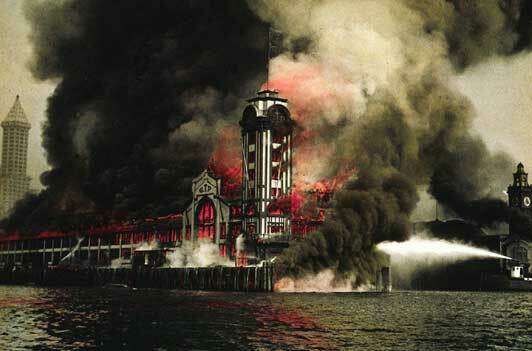 Traumas for Colman Dock returned in 1914 when its neighbor, the Grand Trunk Pacific Dock, the next pier to the north, made the biggest fire in Seattle since the “great one” of 1889. Sparks ignited the top of this Spanish tower, but the fire was hosed before it could reach the clock. 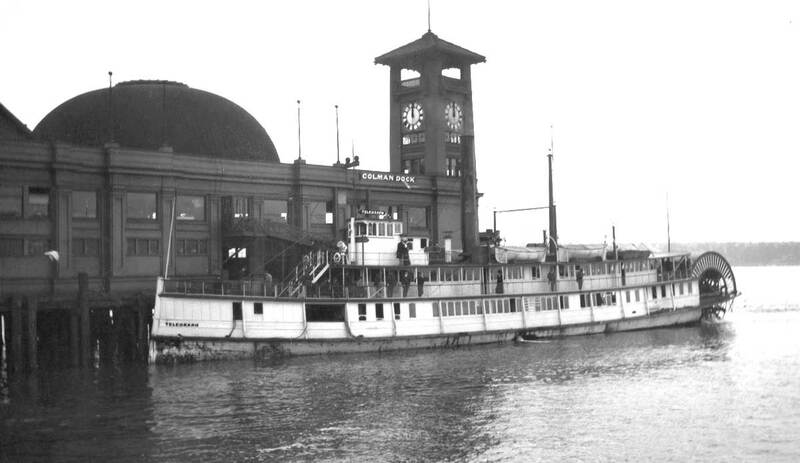 The repaired tower and the dock it topped were razed in the mid-1930s for a new Art Deco-style Colman Dock, which complimented the Black Ball line’s newest flagship, the streamlined ferry Kalakala. The H.B. 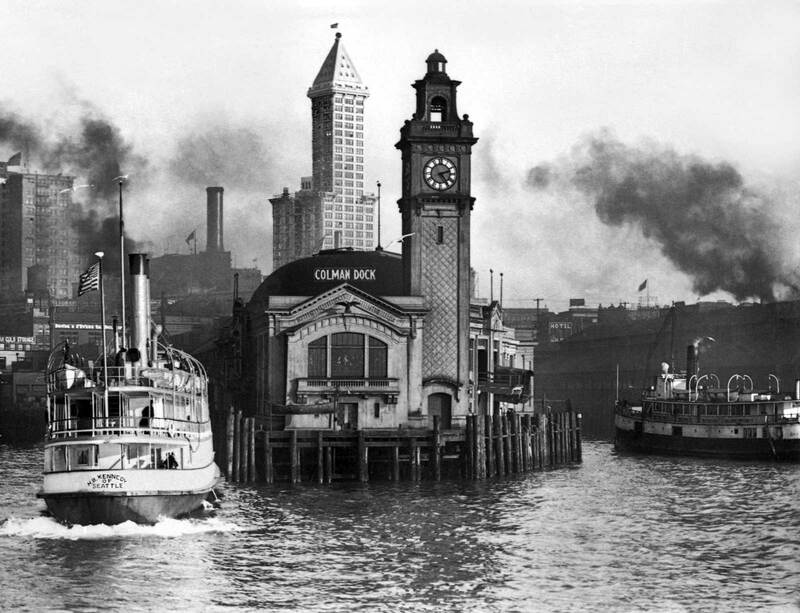 Kennedy’s changes included a name change to Seattle and 1924 alterations into an auto ferry. It kept the same back-and-forth to Bremerton. 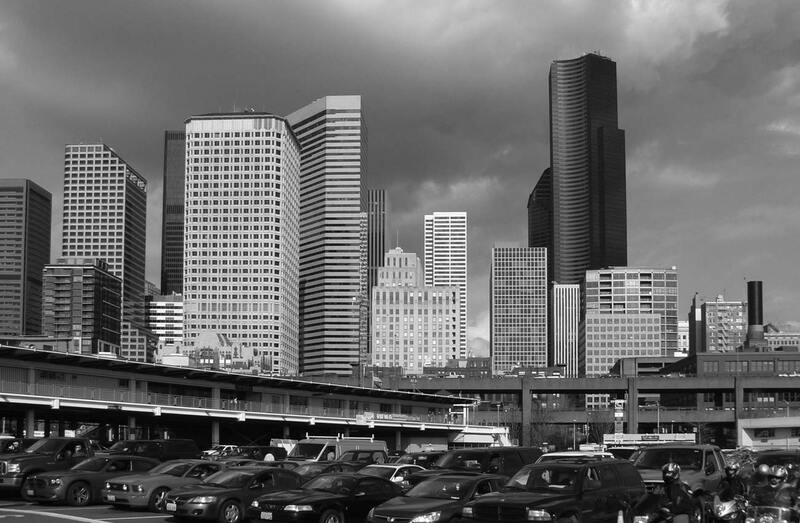 Jean Sherrard’s version of what must be one of the most popular photographic subjects in Seattle, is offered considerably wider than the “then” shot in order to show-off the city, and frankly, the clouds above it too. Both these views and others of the 1909 and 1937 Colman Docks, also recorded from the bay, are part of our exhibit on “Repeat Photography” that is now up at the Museum of History and Industry. When I was high atop Smith Tower this past spring, I took shots in every direction. This is one of Colman Dock, looking west. Yes Jean, we have some additions, again. 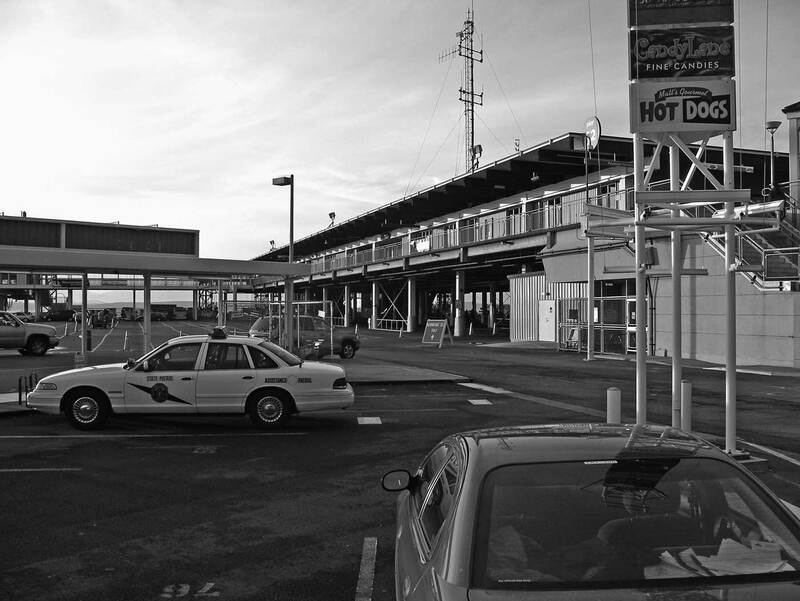 We will start with some links to stories we have done earlier on this blog that touch on Colman Dock. Below those we will add a few more features (although not many) and pictures. This also includes some looks at Colman Dock – from the bay. This first shows the dock with a SYKES photo from the viaduct. First we will compliment Jean’s contemporary look at Colman Dock and its waterfront from the Smith Tower with a few more from the same prospect. 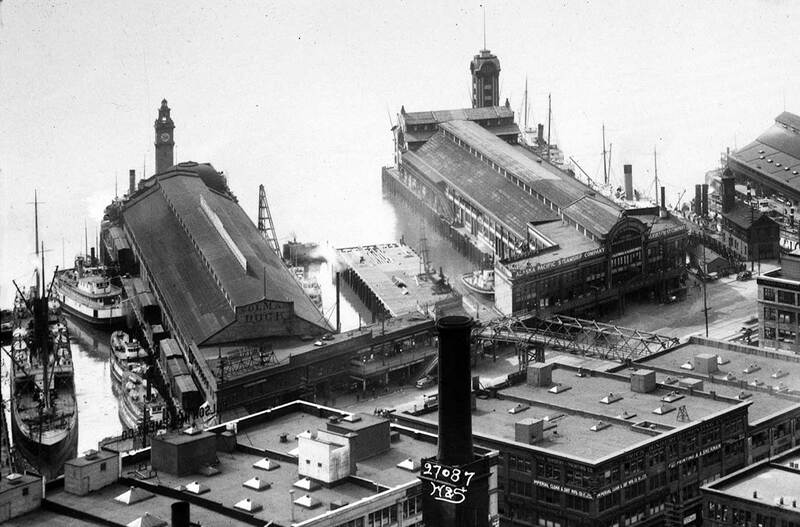 Colman Dock with its second tower on the left, and the Grand Truck pier with its first and fated tower on the right, ca. late 1913 to early 1914. 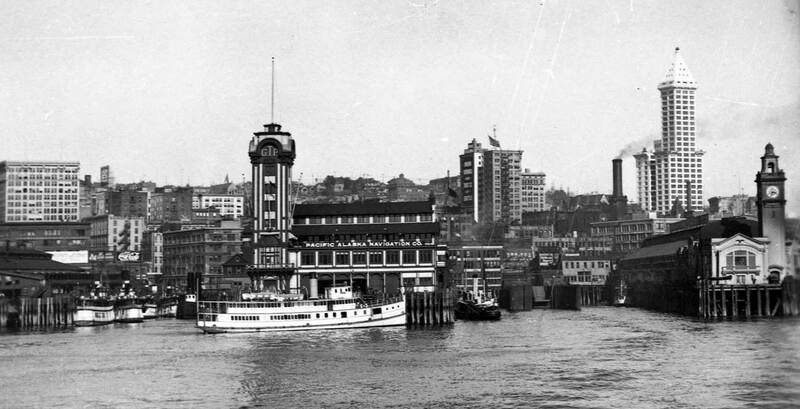 Looking back at the Smith Tower in 1913 with the waterfront towers reversed: Colman Dock #2 on the right and Grand Trunk (temporarily) on the left. 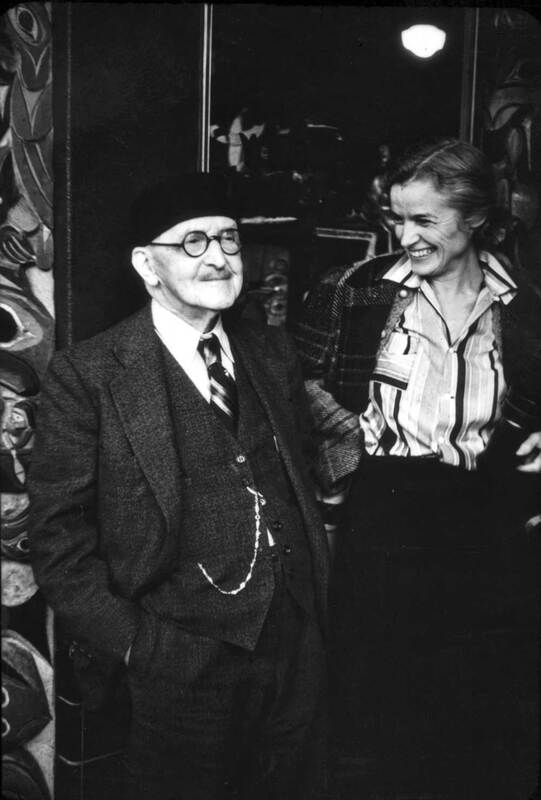 This is a Webster and Stevens photograph from MOHAI. A while later - early 1914. The Grand Trunk's demise by fire is near at hand. The Grand Trunk has not only lost its tower, but it's entire warehouse. Here it is rebuilt sans tower. 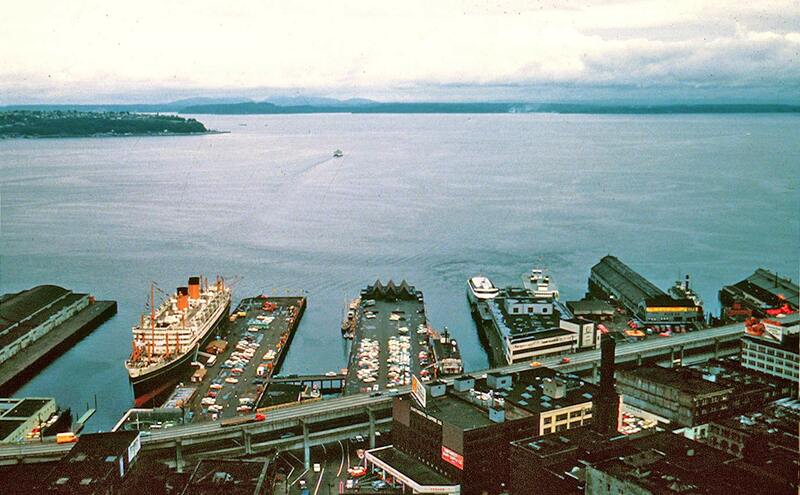 Colman Dock is on the far left. The Hoge Bldg is on the right. It is another Webster and Stevens studio photo. 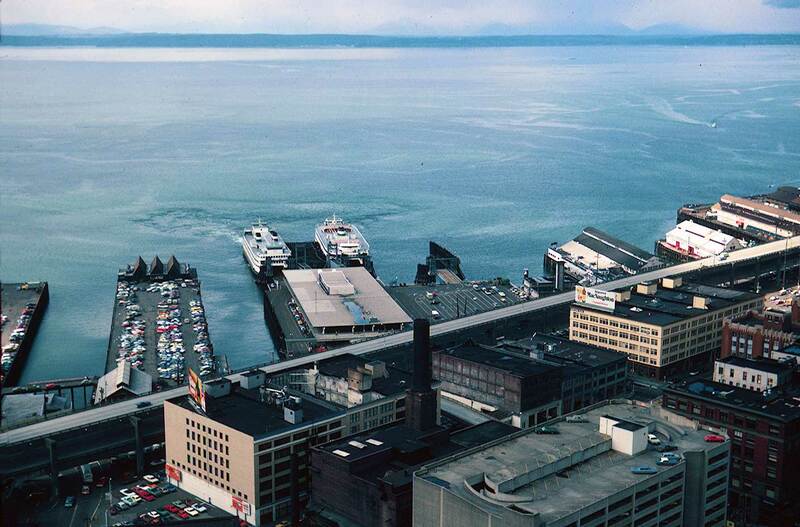 A Century 21 waterfront as seen from the Smith Tower in 1962. Note the "botel" Dominion Monarch on the left tied for the duration of the fair on the south side of the Alaska Pier 50 at the foot of Yesler Way. Pier 51, with more parking and the Polynesian Rest. is at center, and the modern Colman dock to the right of it. To the right of the Colman the towerless Grand Trunk dock survives. Ivar's Pier 54 is far left. and Pier 48 far left. Photo by Richard Schneider. 1976 Smith Tower inspection from all of Pier 51 parking and Polynesian Tiki on the left to part of Pier 56 on the right. Photo by Lawton Gowey. This, perhaps, is the classic Colman with its slips crowded by "Mosquito Fleet" steamers and the steam plant at Post Street streaking the sky with its momentarily airborne droppings. A likely date is 1909. 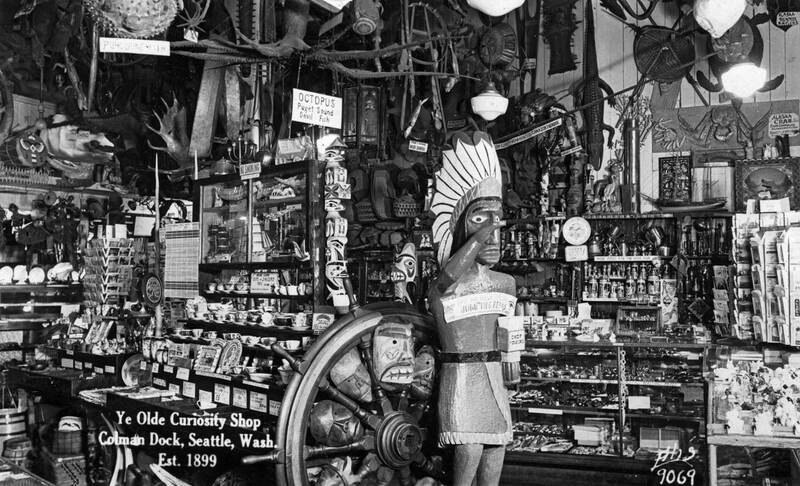 This 1911 look at Colman Dock has been copied from a photo album of Golden Potlatch photos collected years ago by local photo and ephemera collector-dealer Michael Maslan. Thanks Mike. 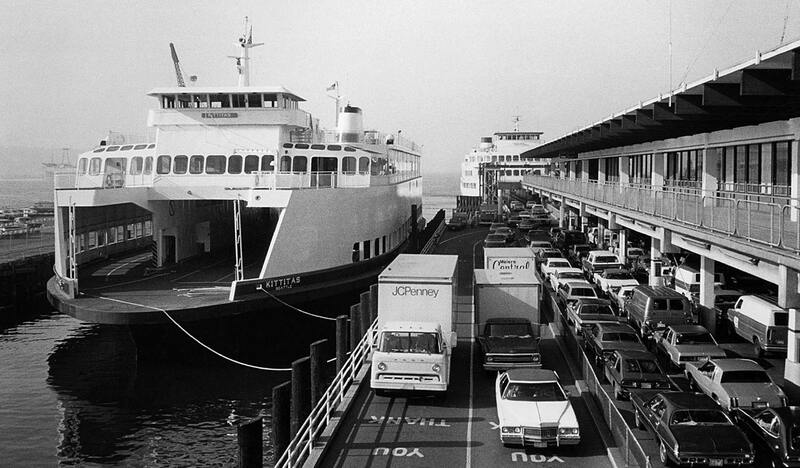 You would be hard pressed today to attract more than 1,000 people down to the Washington State Ferry Terminal, Colman Dock at Pier 52 to watch first a plane fly by and then one boat arrive. Yet that is exactly what caused all the excitement on July 17; 1911, during the city’s six-day Golden Potlatch celebration. 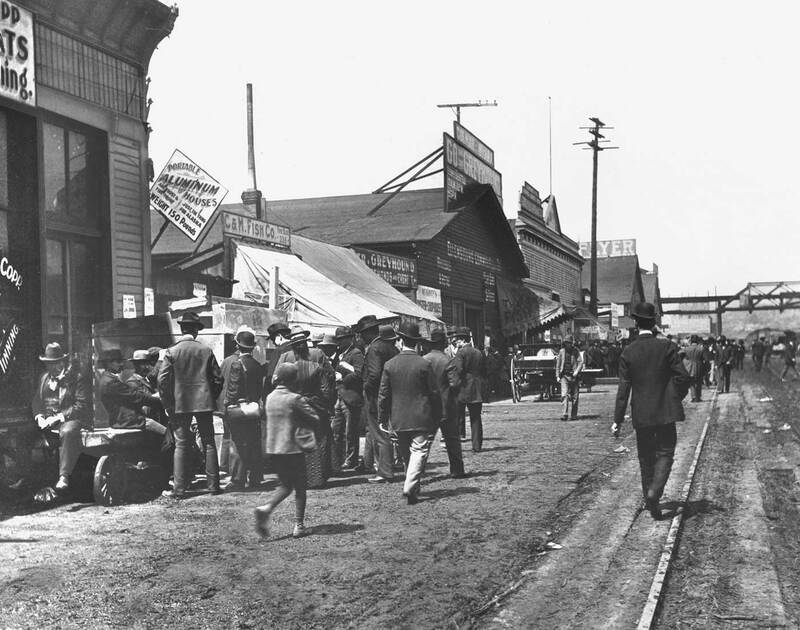 The scene records an afternoon moment on July 17, 1911 during the city’s six-day Golden Potlatch celebration. 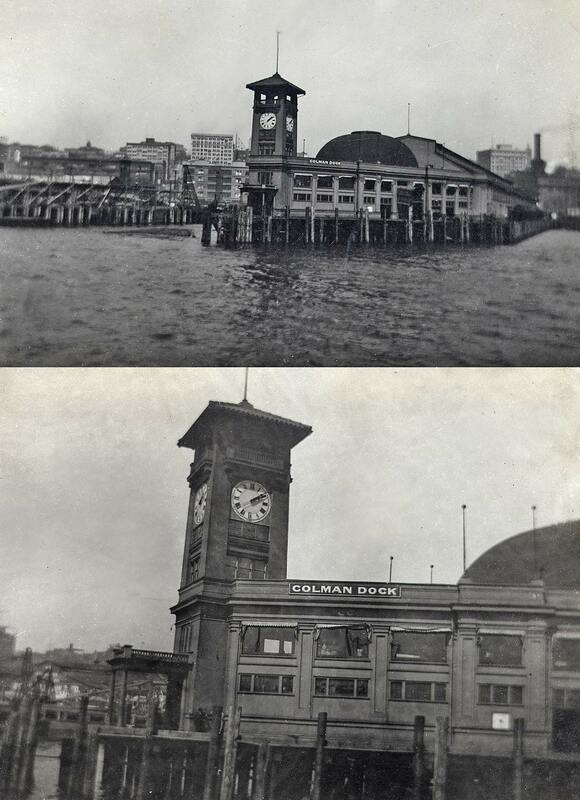 The subject is the then three-year-old extended Colman Dock with its impressive dock tower. 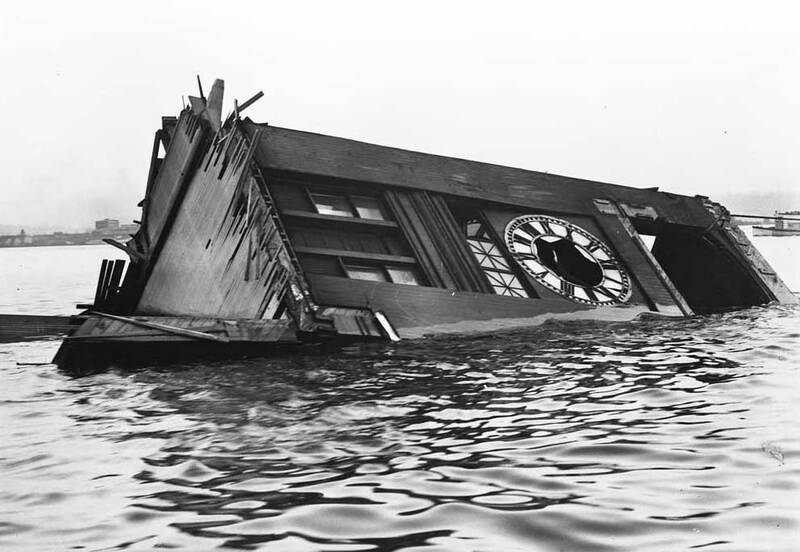 At exactly 1:25 p.m. (the time on the clock) Eugene Ely, pioneer aviator, took off from the mudflats of Harbor Island in his Curtiss bi-plane and was soon to sweep by overhead to become the highlight of the city’s first summer festival. A short time later, at 2:10 p.m., eyes were turned toward the bay for the arrival (actually a re-enactment) of the steamship Portland with its ton of gold, in approximation of how it had docked fourteen years earlier at the start of the gold rush of 1897. The ship’s gangway touched down at the slip north of Colman Dock, the king and queen of the event stepped to shore and were led off to a parade through the city streets. A second parade, this one afloat, was part of the festivities and included the H.B. Kennedy and Athlon, both in the 1911 photo. The Golden Potlatch was a potluck of symbols favoring the sea, economic growth, pioneer nostalgia and sentimentality for native ways at a time when Seattle advertised itself as “the fastest growing city in the world.” The golden portion of the title came from Seattle’s enduring obsession with the earlier gold rush and the belief that it was responsible for the recent prosperity. Such summer celebrations were to continue for longer than the unfortunate clock tower. 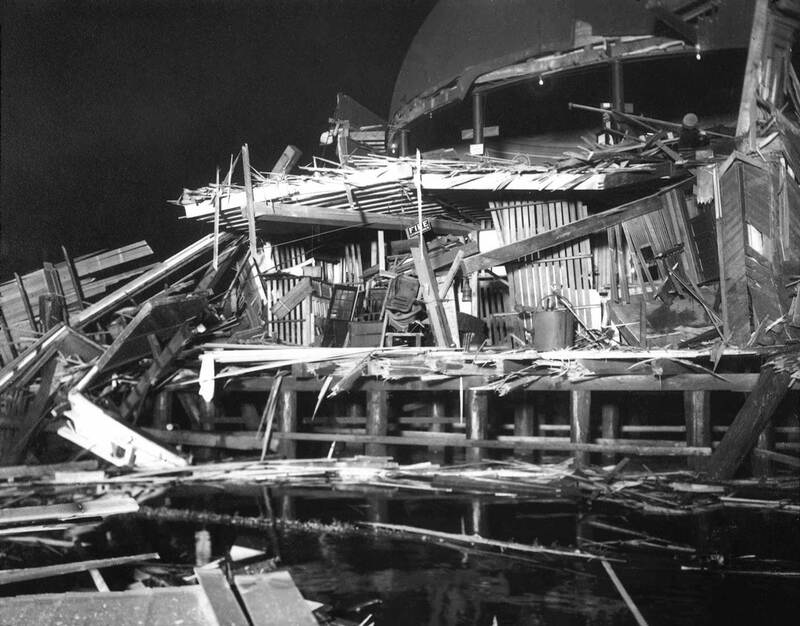 The next year the entire front end of the old pier was rammed by a steel-hulled steamship named the Alameda and the tower toppled into the bay. The Golden Potlatch returned in 1912 and 1913, but then discontinued until revived for a few years during the Great Depression. World War 11 put a stop to that and Seattle was without any summer celebrations for nine years until the 1950 inauguration of Seafair. 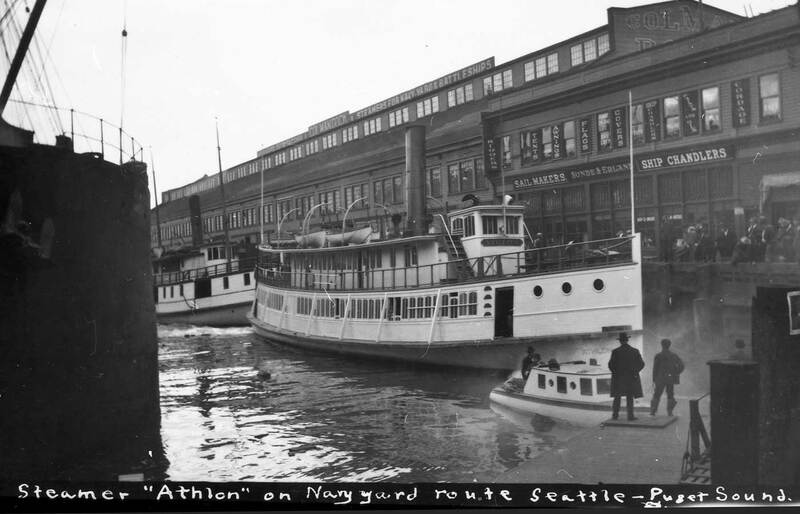 The Athlon, seen above beside Colman Dock in 1911 or 1912, was one of the mainstays of the “Mosquito Fleet” of small steamers that once buzzed about Puget Sound. Built in Portland, the Athlon was named for the Irish town Athlone on the Shannon River. It was built for a rate war on the Columbia, and at 112 feet and 157 tons, was sufficiently fleet to persuade its competitors to cooperate in fixing fares on the river. Having won the battle, it was sold to Puget Sound’s H.B. 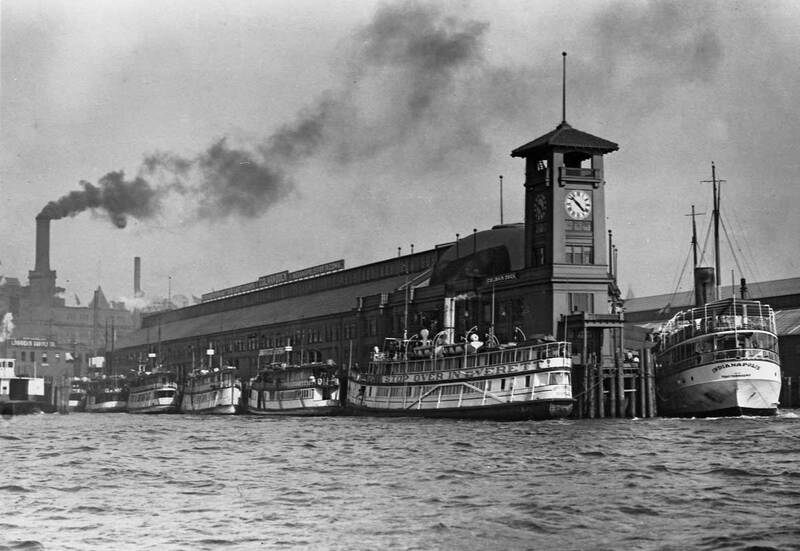 Kennedy Transportation Co. and in 1901 was put on the Navy Yard Route in competition with Joshua Green’s Inland Flyer. Almost immediately Green and Kennedy joined forces. In 1913, the Athlon was used by the Puget Sound Steamboat Owners Association in wonderfully absurd parody of proposed safety legislation. Following the letter of the law as originally written in the LaFollette Seamen’s Act, the association stacked or tied 19 lifeboats to the 112.4 foot steamer – eight were crammed on available deck space and 11 others attached alongside in a scow. The law was amended. In 1914, the Athlon was sold to the Moe Brothers for yet another competition – this time with the Kitsap Transportation Company’s inadequate service to Bainbridge Island and Poulsbo. It remained on this route for six years until Aug. 1, 1922, when in a heavy fog it struck Ludlow Rocks at the entrance to Port Ludlow. The crew and nine passengers made it ashore but, except for what could be salvaged, the Athlon was a total loss. Both “principal” views look north on the waterfront from a little ways north of Columbia Street. 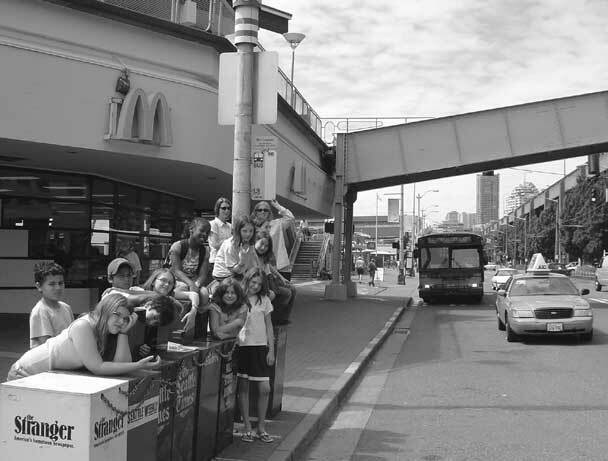 In the “now” scene the familiar Marion Street overpass to Colman Dock misses “repeating” the Seattle Coal Co. trestle that shows far right crossing Railroad Avenue at Madison Street in the “then” photograph recorded by the Norwegian Anders Wilse during his residency here in the 1890s. The third view, below the text, features benches at Colman Dock’s Railroad Avenue façade facing east, circa 1909. 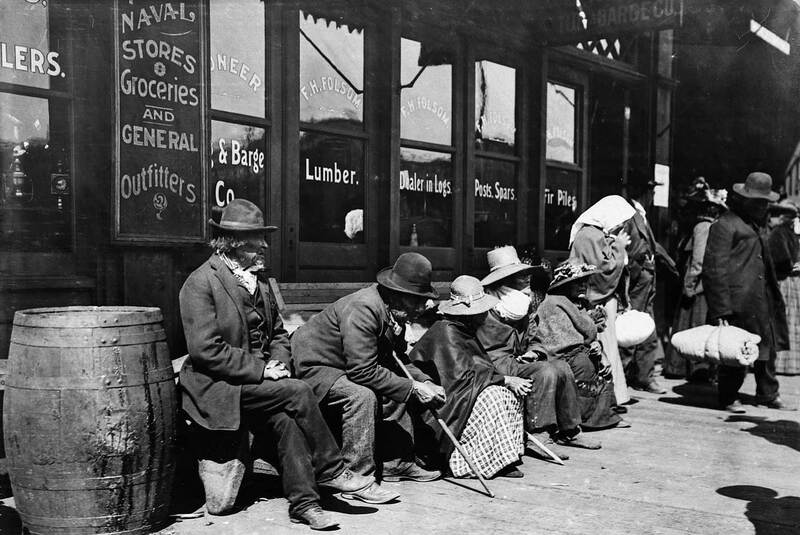 With his back to Columbia Street Andres Wilse nearly straddled the most westerly of 16 rails (8 tracks) that crowded Railroad Avenue to record this waterfront gold rush scene. The year is probably 1898 – but it may be 1899. The flooring here is not dirt but very worn planking almost pulverized in places – soft but dangerous. The planks are very thick and could take the pounding. After about seven years they need replacing. Beneath this wide trestle the tides slipped back and forth through whatever rubble or refuse might have been dumped there. Some planks were removable for convenient dumping. During the Gold Rush this two-block section between Columbia and Madison Streets was an oddity. The docks were stubby and the services mostly local. In a 99-day period in the late winter and spring of 1898 one hundred and seven ships sailed for the Klondike from this waterfront, but most of them from piers that were either north of Madison or South of Columbia. The leaning sign nailed to the wall of the building far left reads, “Portable Aluminum Houses, Frost and Fire Proof, Just the Thing for Alaska, Weight 150 Pounds.” (But aluminum would have been more useful for flying to the Klondike than for keeping warm there.) Otherwise – reading more signs – in this section one can buy a salmon either from C&M Fish or AAA Fish, get almost instant nourishment at McGintry’s Oyster and Chops House, board the West Seattle Ferry (through the distinguished façade to the left of the power pole), or catch either of two popular and swift “Mosquito Fleet” steamers: the Greyhound for Edmonds and Everett or The Flyer for Tacoma. I confess that the contemporary photo was taken a few yards west of the Norwegian Wilse’s position. (Railroad Avenue was later widened for wagons.) That way I stayed out of harm’s way and could “repeat” the cluster of men in the “then” with the 4th and 5th graders of Happy Medium School who at the time were on a waterfront tour with their teacher Reba Utevsky. Above: Seattle’s future business district recorded from the end of Yesler’s Wharf probably in late 1886. (Courtesy Lawton Gowey) Below: Colman Dock, left, and the still relatively young city’s skyline have both changed notably in the intervening 120 years or so. 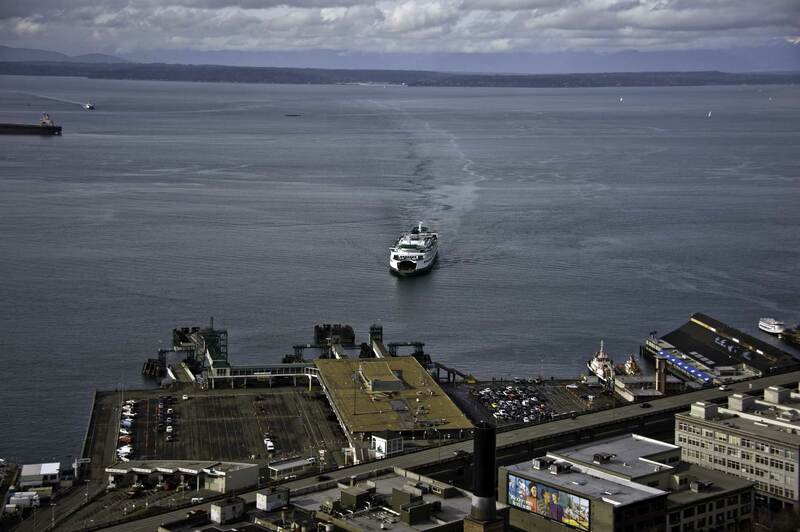 Courtesy of Shawn Devine, Communications Coordinator, Washington State Ferries. A thumbnail orientation, right to left, of the scene starts with Columbia Street on the far right; Central School, at Sixth and Madison, the highest structure on the horizon (with the bell tower); the Fry Opera House at the northeast corner of First Avenue. 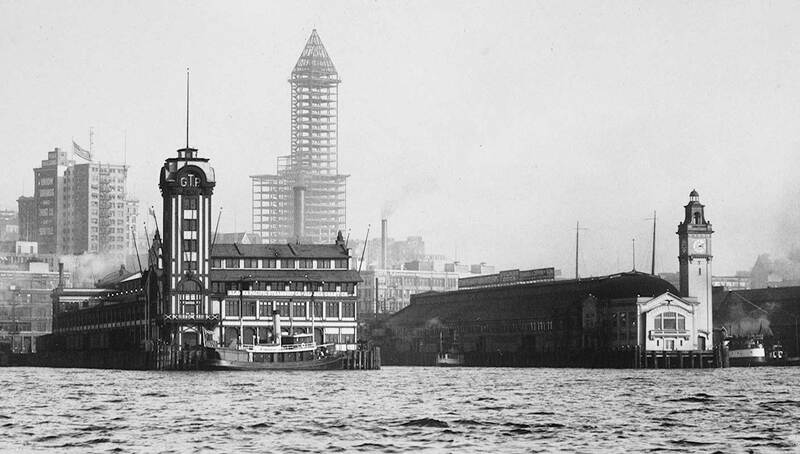 (Front Street) and Marion Street, the large structure with central tower at the scene’s center; the University of Washington main building with its tower escaping the horizon at the northeast corner of Seneca and 4th Avenue (small but obvious enough); and an early Colman Dock, reaching into the bay. 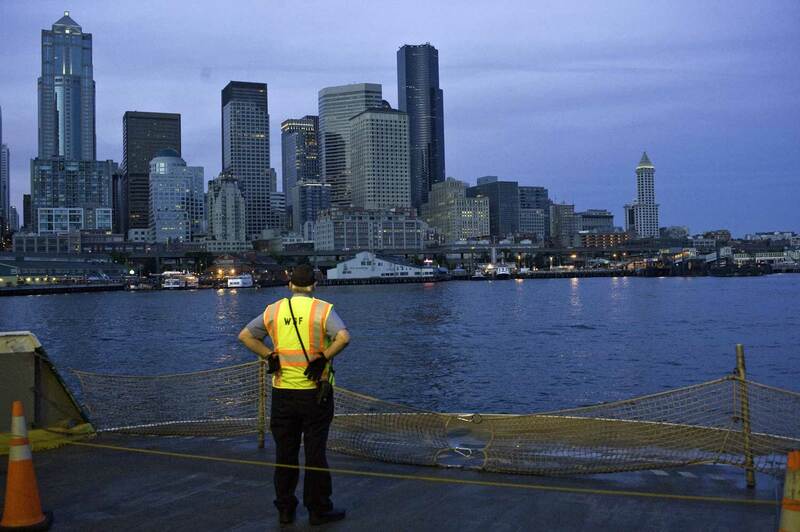 The implied part in this panorama by the photographer George Moore is his perch, Yesler Wharf. It’s dog leg end turned far north into the bay and beside providing a traditional prospect for photographers also gave John Colman, the builder of Colman Dock, an obstruction to reasonably sue. The “Great Fire” of 1889 would solve the problem. Two 1886 events worth note. The Budlong Boathouse is at the very center of this pan. A sailboat is tied to its south side. 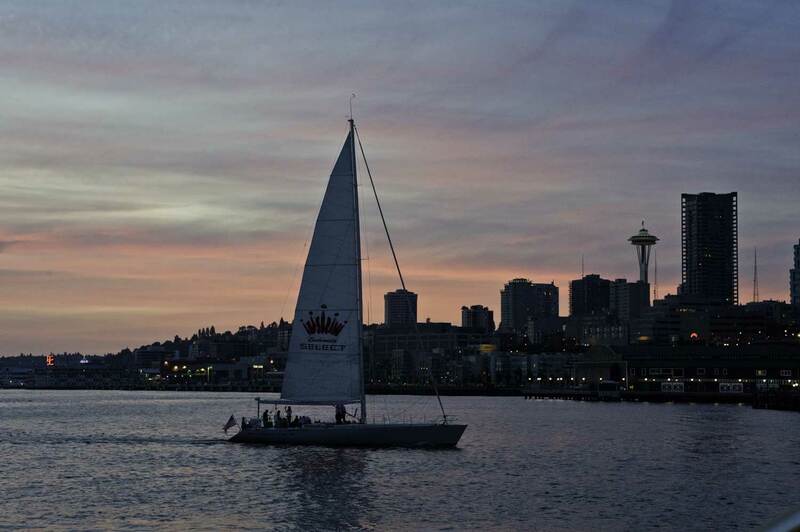 The Puget Sound Yacht Club got organize there this year, and also ran its first cup race in August of 1886. Almost certainly the above is the oldest formal (more of less) portrait of what after its founding in 1899 quickly became a waterfront institution. 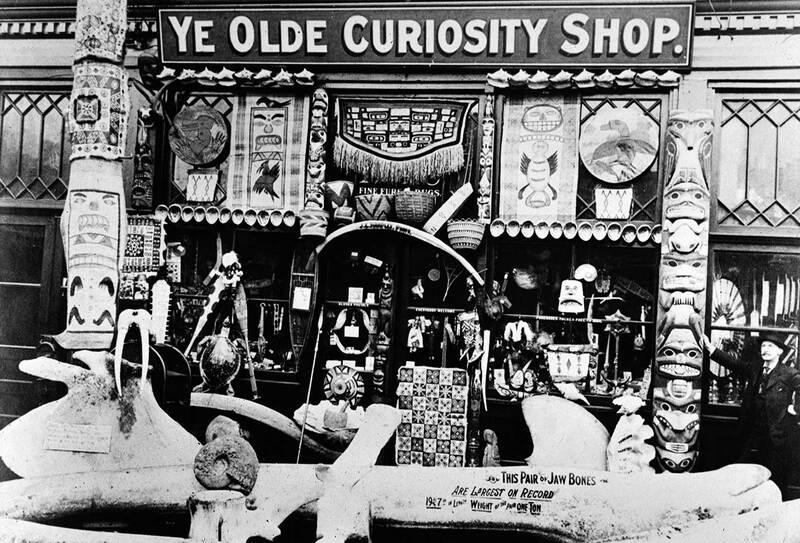 “Beats the Dickens” is the slogan Joseph “Daddy” Standley embraced in allusion to the Victorian novelist, one of whose popular stories was titled for another Ye Old Curiosity Shop. But it was not Charles Dickens’ fiction that originally inspired Standley into the buying and trading of Indian artifacts and natural curiosities, but a volume titled “Wonders of Nature” that his third-grade teacher awarded him for having the neatest desk in his class. This "now" was scanned from the Pacific clipping. We have temporarily misplaced the original. But now we have found it, or rather them. After its move to Colman Dock. Courtesy Waterfront Awareness. As the organized clutter of Daddy’s shot, inside and out, suggests, Standley required a talent for keeping a neat desk if he was not to be overwhelmed by the stuff that went in and out of his waterfront curiosity. 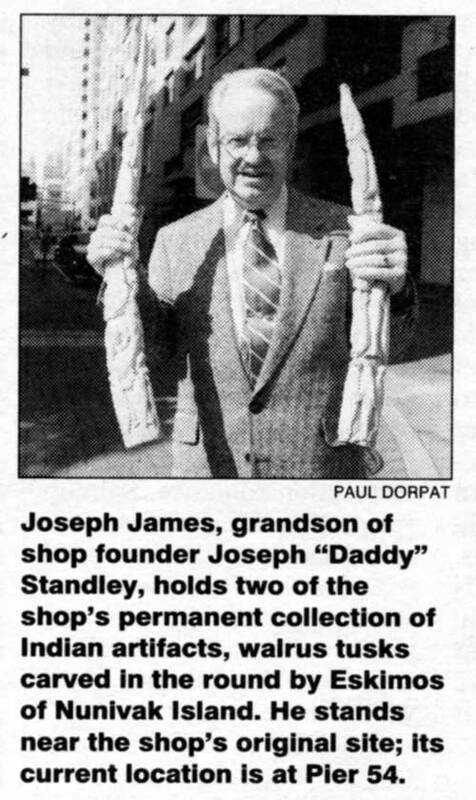 He was, needless to say, a great collector. Only 10 years after he opened his shop, his ethnological collection won the Gold Medal at the 1909 Alaska Yukon and Pacific Exposition. Subsequently he sold this entire exhibit to George Heye of New York, the founder and original curator of the Museum of the American Indian. Daddy Standley with the photographer Link Lingenbrink's not named friend posing in front of Yes Olde Curiosity Shop ca. 1930. Enter Kat Duncan, a summertime Ballard resident and professor of art history at Arizona State University. 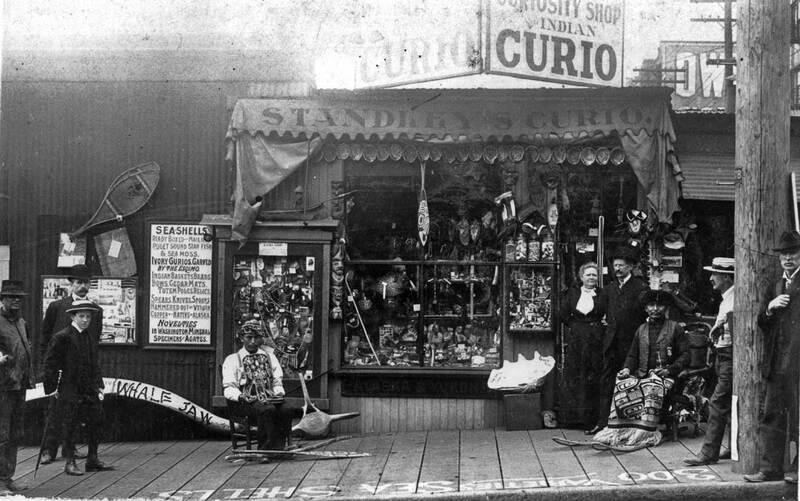 In her study of museums that specialize in the preservation of Indian artifacts, Duncan quickly learned that Ye Olde Curiosity Shop has long been one of the important providers of – as the faded sign above the storefront here puts it – “Indian Curios.” Duncan was pleased to discover that the founder (who worked to within four days of his death in the fall of 1940) was also a good recorder of his own habits and collector of his own ephemera; order books, diaries, photographs and news clippings. 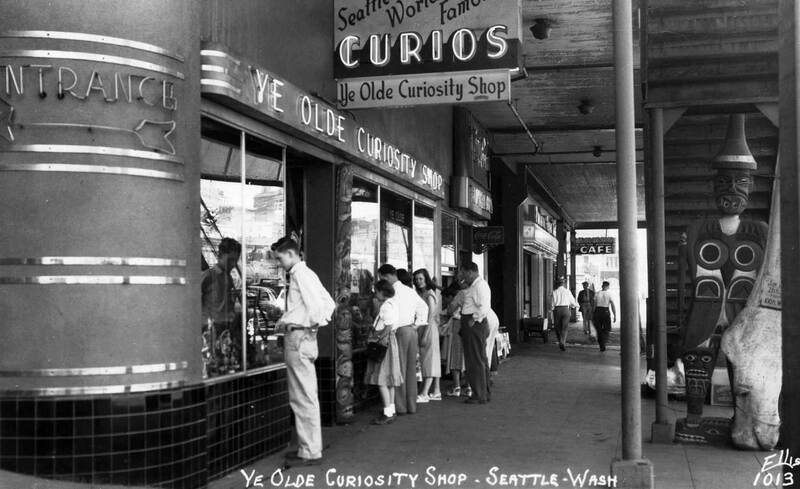 At the Curiosity Shop in its neon years. Another Ellis postcard used courtesy of Ron Edge. 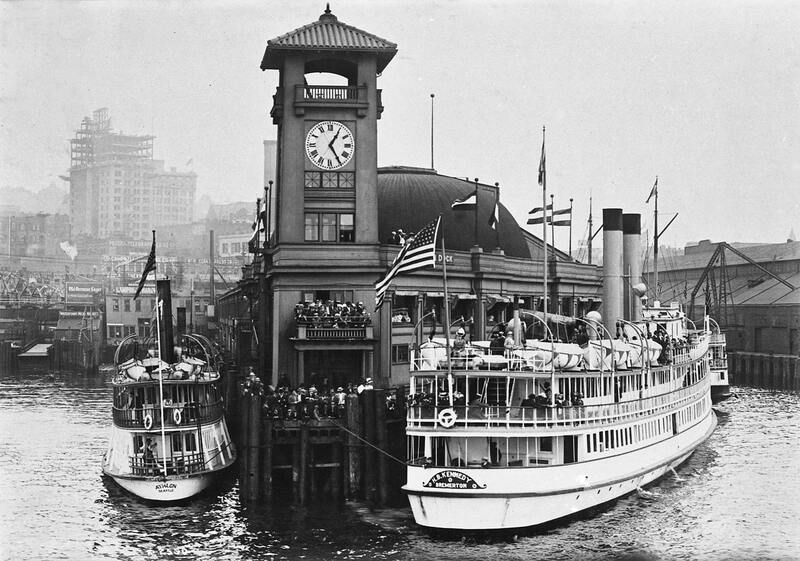 Above: The Spanish-style Colman Dock with its landmark clock tower was only four years old when the steel-hulled Alameda cut through its outer end in an outsize docking blunder. 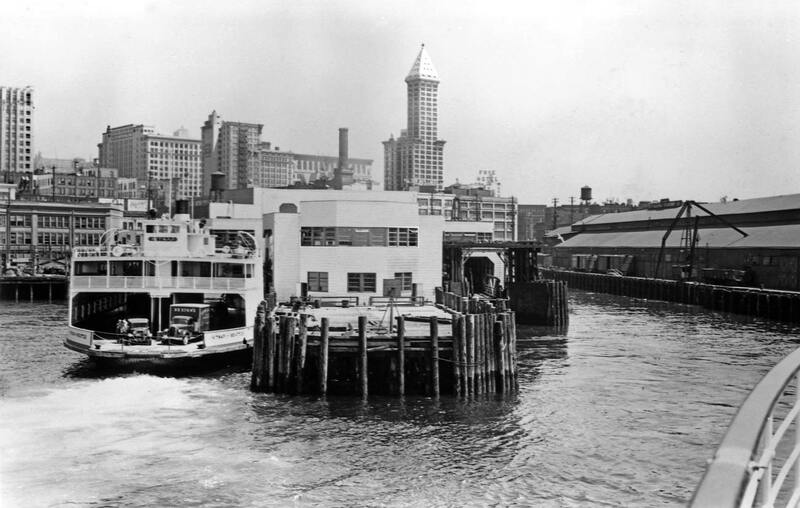 Overhauled with a new tower the 1908 pier was next renovated in the mid 1930s as a moderne terminus for the Kalakala “the world’s first streamlined ferry.” The contemporary Colman Dock, below, dates from 1961 – the dock not the picture. It dates ca. 2004. 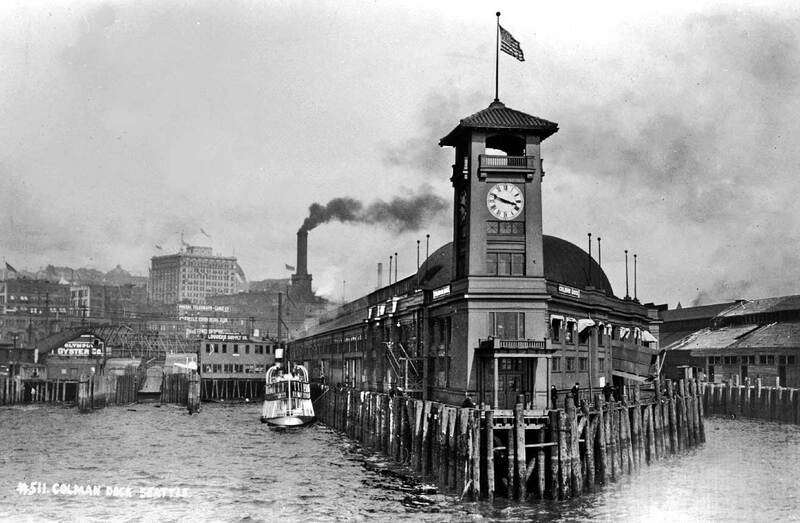 The 1908 Colman Dock with its first tower. 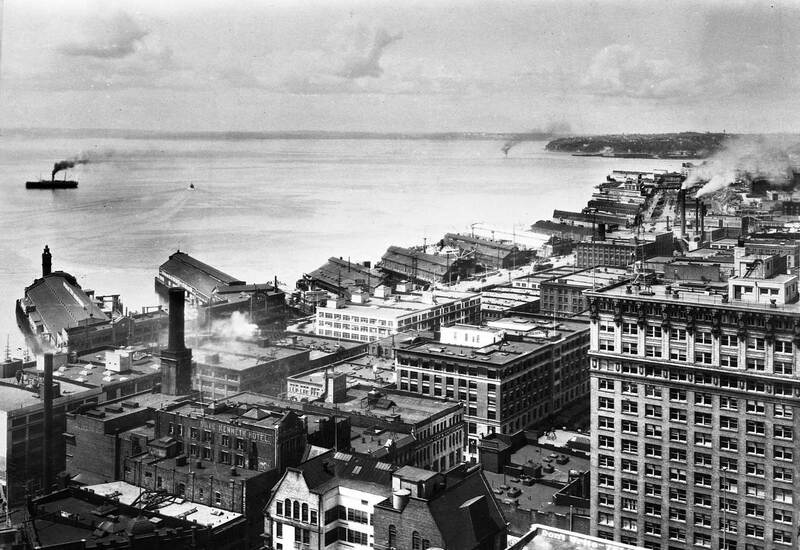 Seattle's first steel skyscraper, the Alaska Building at Second Ave. and Cherry Street, breaks the horizon on the left. The bottom photograph of these two, records nearly the point of view of the Alameda's captain O'Brien soon after he called for full steam astern and got it ahead instead. liner. With the Alameda resting about 250 yards west southwest of the pier head Capt. John (Dynamite) O’Brien acting as port pilot gave a “full astern” order to Third Assistant Engineer Guy Van Winter who in turn relayed it verbally to Second Assistant Robert Bunton. Bunton, who was at the throttle, either heard or understood the order as “full ahead” and quickly jerked the Alameda into action with these results. First tower dropped in Elliott Bay by the crashing Almeda. The Telegraph in the position she held when sunk by the penetrating Alameda. This look at her is - obviously - before the crash. 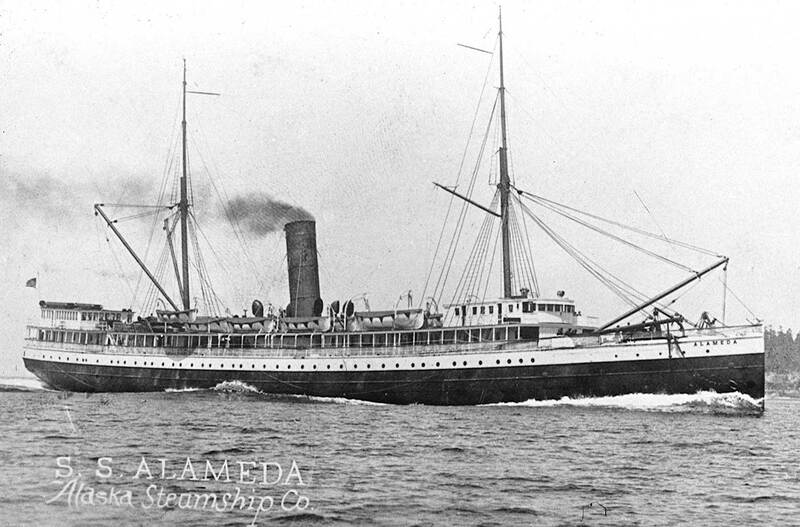 The Alameda was floated again but the first tower was replaced with the second. other piers but for the quick thinking of O’Brien. 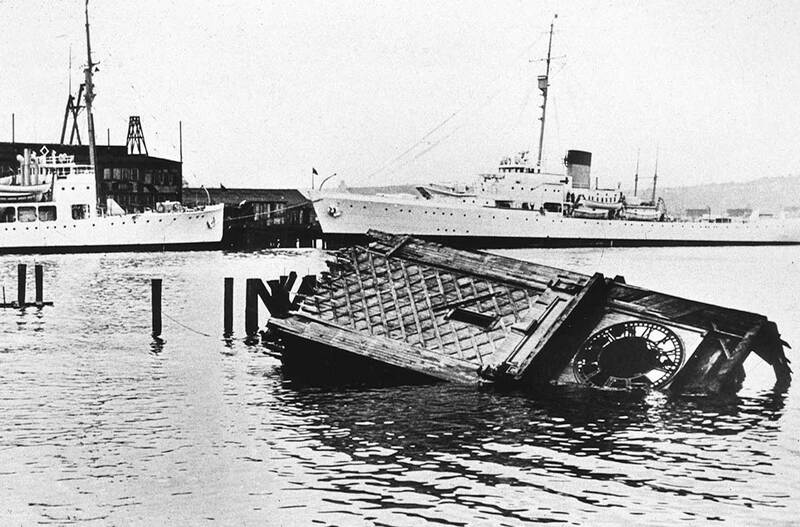 When the ship surged forward the captain shouted for the anchors to be dropped and after 125 fathoms of chain were out, the starboard anchor caught and the next pier north – the Grand Trunk Pacific Dock, then the largest wooden pier on the coast – was momentarily saved. It burned down two years later. 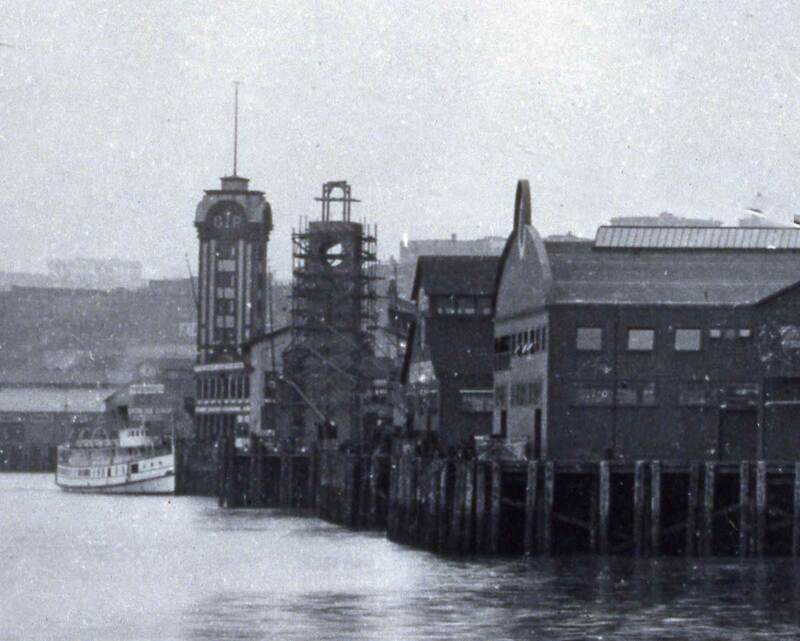 On the left, the first Colman Dock tower from the bay, circa 1909. 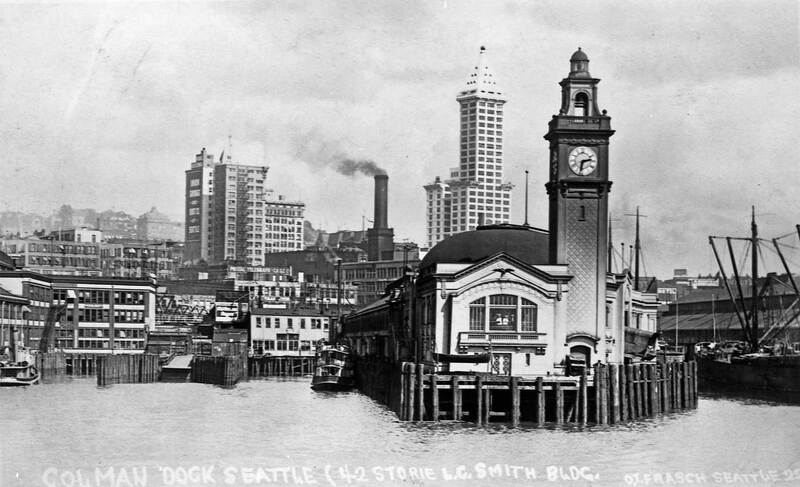 The two piers at the center replaced Yesler Wharf at the beginning of the 20th Century. The above dates, most likely, from early 1914 before the Grand Trunk, seen in part on the far left, burnt to the water. Construction work on Colman Dock's second tower with the Grand Trunk tower beyond it. Approach the modern Colman Dock probably sometime in the late 1930s. The "post-modern" Colman Dock with the Kittatas beside it. I think this is from the 1970s, but I do not remember taking it - another of the tempoary drifters in my collection. CORRECTION: Gavin sends along this correction: "The Kittitas was built in 1980. I suspect the ferry is new here and that is why the picture was taken, which would date the picture from 1980, not far from your guess (and some would insist that year is still part of the 70s). Someone adept at dating car models might be able to come up with more." Gavin's note helps me remember the source of the above photo. 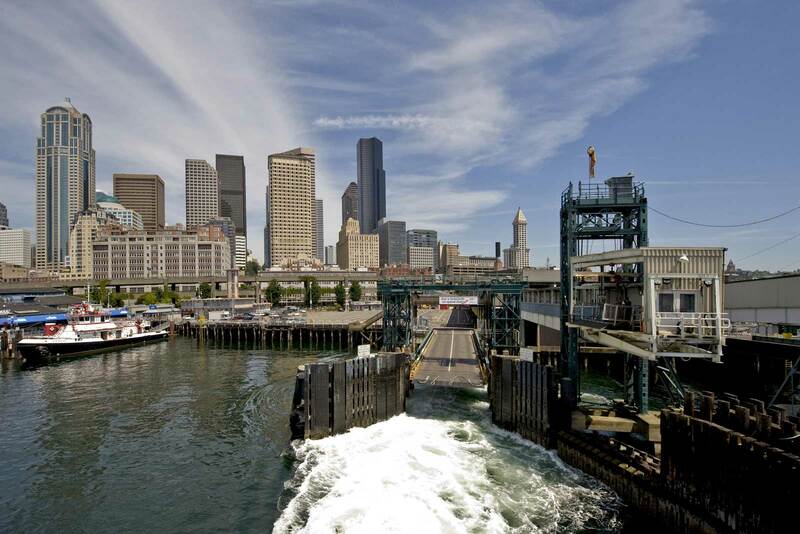 It was got from Washington State Ferries during the course - in the late mid-1990s of writing the book "Building Washington," which is included on this blog - all five pounds of it made light - and can so be read in toto and for free. See the books button. It appears in chapter 1 "Waterways" on page 39 with other ferries. The Kittitas was built in 1980. I suspect the ferry is new here and that is why the picture was taken, which would date the picture from 1980, not far from your guess (and some would insist that year is still part of the 70s). Someone adept at dating car models might be able to come up with more. Your series on Colman Dock is really fabulous to read and enjoy. I was wondering though if you could do another addendum; it is surprisingly hard to find photos of the interior of the old Art Deco terminal building. I have wondered what it looked like inside and see some of the details. I am seeking color details of the Coleman Dock 1913 for an oil painting. I have confirmed the color of the clock face as it was restored. Anything would be helpful. I have found a hand colored postcard which seems to show the exterior as a buff or sand color.